Welcome to Western Pleasure Guest Ranch, where stunning views and fresh mountain air greet you. Imagine an Idaho dude ranch vacation that takes you back to nature and introduces you to the adventure and spirit of the West. During the summer months, guest ranch vacation packages include lodging in one of our lodge rooms or log cabins, daily horseback rides, three country gourmet meals daily, evening entertainment and access to all guest ranch amenities. During the Fall, Winter and Spring, enjoy a Bed and Breakfast stay in a lodge room or rent a cabin for a cozy get away. Two hour guided horse back rides are available in the Fall and Spring. When the snow flies, wrap up in a blanket and enjoy an old fashioned sleigh ride. Group retreats, family reunions, dinner parties and holiday gatherings are also available for your large or small group. We specialize in personalizing your dude ranch stay to fit you. Relaxing or riveting… it’s all up to you. It is time to start making your summer 2019 ranch vacation plans! All-Inclusive Guest Ranch vacation packages include lodging in one of our cozy Grand Lodge Rooms or Log Cabins, daily horseback rides, three Country Gourmet meals daily, evening entertainment and access to all ranch amenities. For the non-rider, our many other activities will fill your day with relaxation, education or adventure. 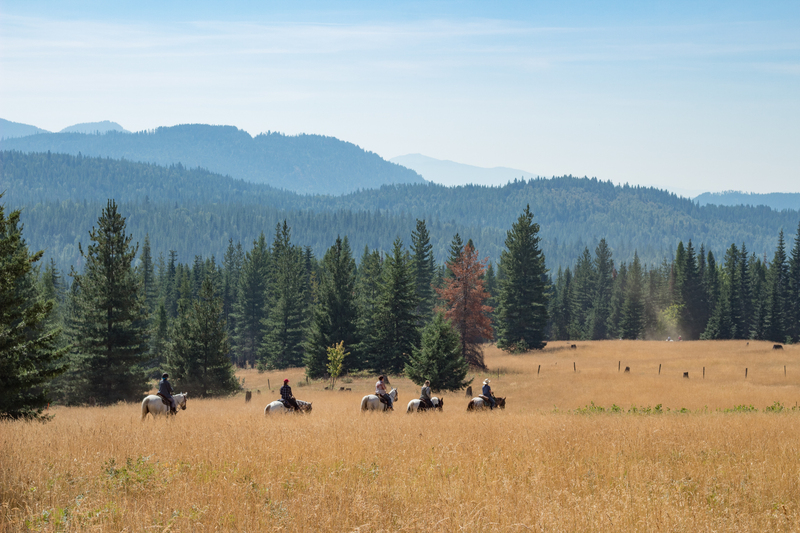 When you’re looking for a fantastic family guest ranch adventure vacation or a ranch that you can visit as a single or a couple, look no further for your Idaho dude ranch vacation than Western Pleasure Guest Ranch! #1 Western Vacation Ranch In America! We are honored to be named the #1 Western Vacation Ranch in America by World Property Journal. WPJ says, “If you’re looking for a true Western experience, in a family-owned – for four generations – Pacific Northwest mountain hideaway, Western Pleasure Guest Ranch is it.” Thank you WPJ for this great honor! Thank you to our hard working, devoted staff; our wonderful guests who visit each year; and our family who support us and work toward our shared vision for Western Pleasure Guest Ranch. All Inclusive Packages include lodging in one of our cozy Grand Lodge rooms or Log Cabins, daily horseback rides, three Country Gourmet meals daily, evening entertainment and access to all ranch amenities. Western Pleasure Guest Ranch’s quality ranch raised horses are perfect for the beginner or the experienced rider. For the non-rider, our many other activities will fill your day with relaxation, education or adventure. We offer fun and exciting experiences for everyone. Plan your next group event or retreat getaway in a truly unique ranch destination for an experience your guests will never forget. Your group will enjoy an authentic rustic setting, a wide array of activities, a diversity of refined lodging options and a staff that will cater to your every need and make you feel like when you are with us, the ranch is truly yours. All the amenities we offer add up to an unforgettable experience for groups of any kind. Make your winter getaway even more memorable with a winter lodging package at Western Pleasure Guest Ranch. There is a little something for everyone from the relaxing spa package to the more adventurous snowmobile package. Ski the slopes at local Schweitzer Mountain Ski Resort or cross country ski from your cabin’s front step on our ranch’s 10+ kilometers of groomed Nordic ski trails. We are very proud of our four legged working partners. We maintain a herd of more than 50 registered Quarterhorses, Appaloosas, and Paints for our saddle horses as well as one team of Belgian Percheron crosses, three teams of Percherons and one team of 1/4 Percheron for our sleigh and wagon rides. Most of the horses are either born and raised right here on the ranch or purchased from other local ranchers.